Once seated in one of the many cozy rooms (maybe a bit too much so as our table was quite small), we decided to share some appies including the Burrata with heart of palm and tomatoes. 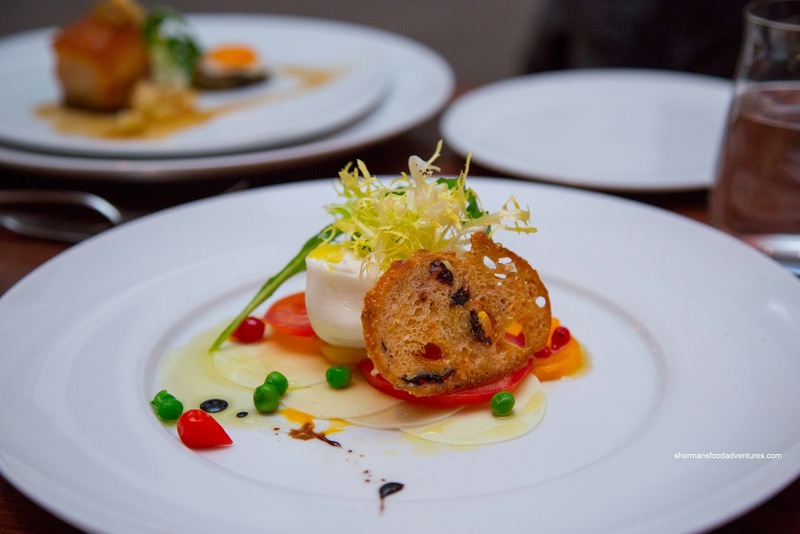 We found the burrata to be creamy and smooth with a light stringiness. The acidity from the tomatoes added a nice balance. Next up was the Pork Belly Toscano with apple mostarda. 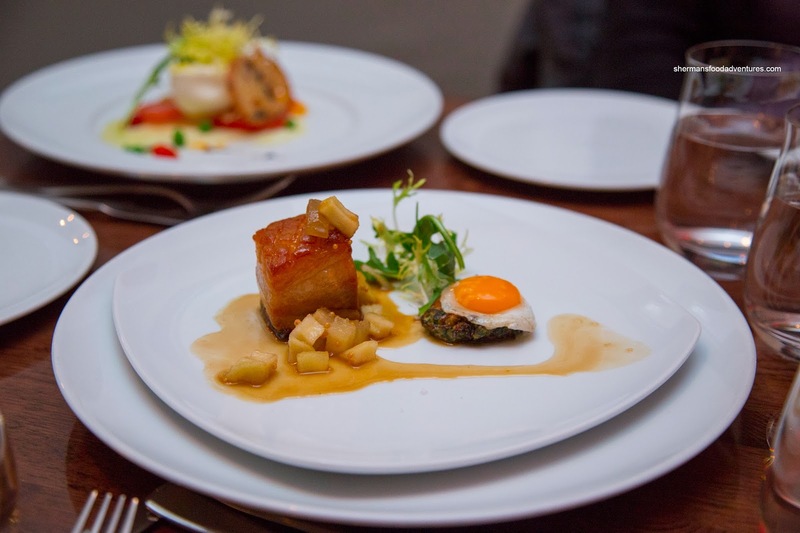 The pork belly was rich, moist and not stringy while the fat was gelatinous without being fatty (for a lack of a better description). I found the crackling to be on point being crunchy, yet not too hard. Sticky and sweet, the apple mostarda featured whole mustard seeds. As for the green disc underneath the quail's egg, I didn't really get to try it, so I can't comment on it. 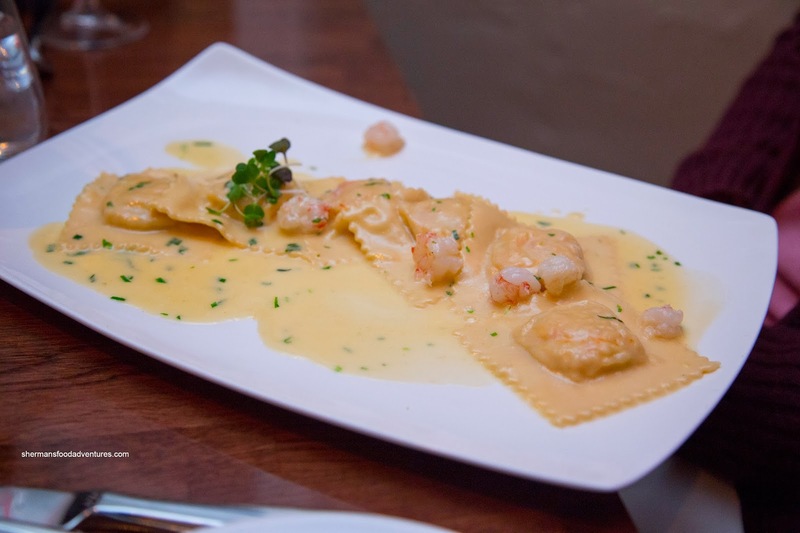 We decided to get an entree version of the Crab Ravioli in a tarragon cream sauce. We found the pasta to be al dente while the crab filling to be fluffy and sweet. The cream sauce was fairly rich with a nice acidity and enough tarragon. I liked that they were conservative with the sodium as well. Costanza covertly added another item as we were eating away. So much so, the ladies were wondering where the Foccacia Bread came from. Well, it was a smart move, especially since it was only $5.00. Straight from the oven, the bread was crunchy on the outside while chewy inside. It was well-seasoned with a nice pesto, salt and a generous drizzle of EVOO. We really should've ordered 2 of these. 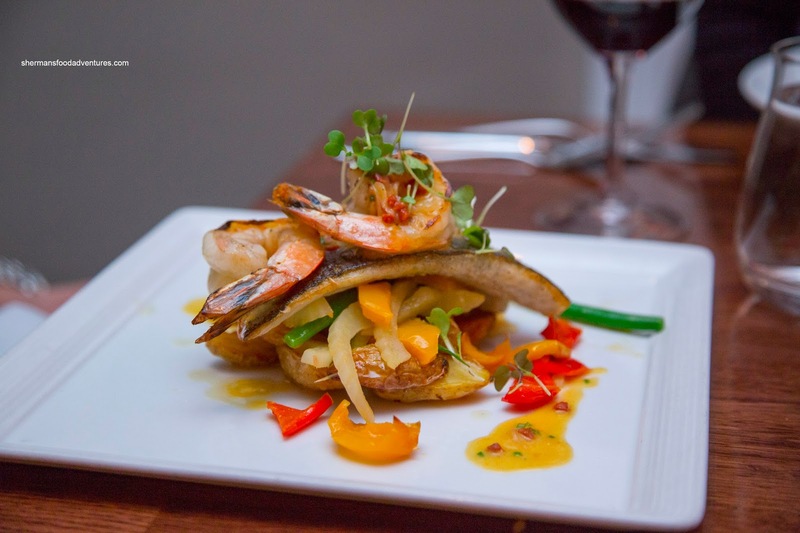 Onto the mains, Costanza had the Branzino and prawns with a medley of veggies and roasted fingerling potatoes. I found the sea bass to be nicely prepared being moist and flaky with crisped skin. It was well-seasoned, but would've benefited from more of the lemon vinaigrette. As for the veggies, they were vibrant and crisp while the potatoes were not devoid of flavour. Elaine went for the Short Rib Brasato braised in Chianti Classico & tamarind. This was also accompanied by veggies and fingerling potatoes. 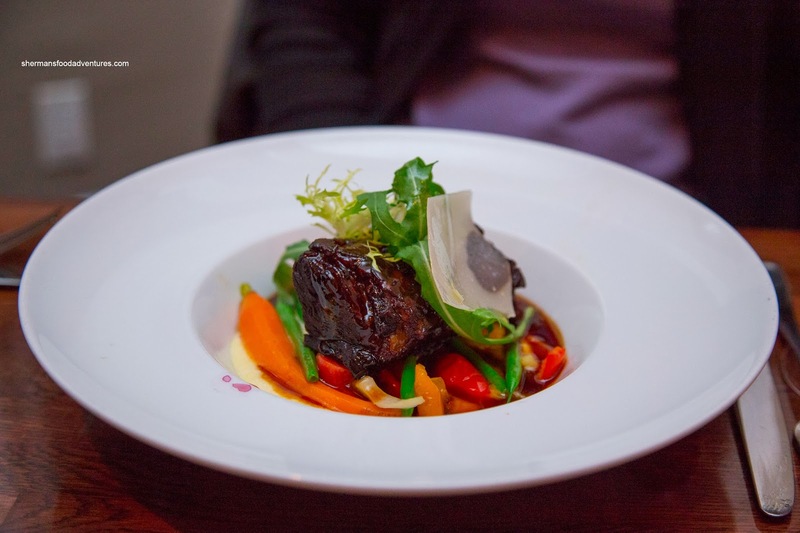 We found the short rib to be sufficiently tender while being a touch stringy. There was no mistaking both the Chianti and the tang from the tamarind which brought the dish to life. Viv ended up with the Grilled Quail a la Liguira with marscapone polenta. 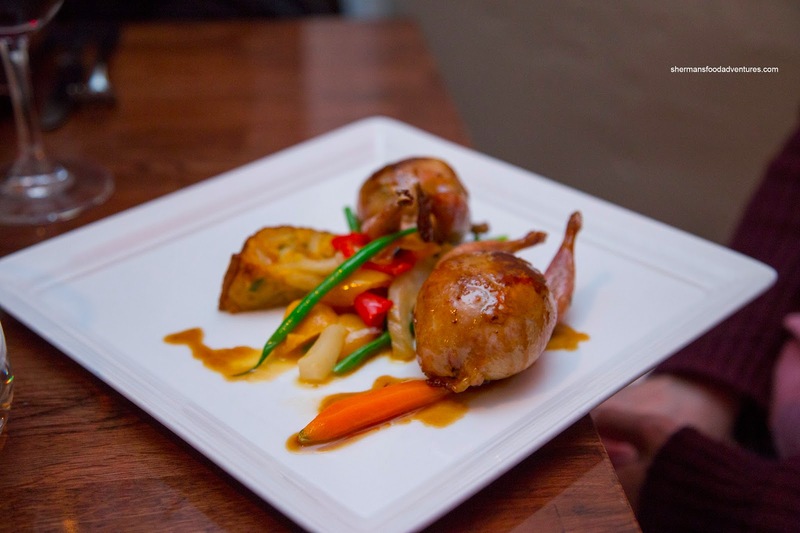 The quail arrived in a beautiful roasted hue where the skin was nicely rendered. As for the meat, it was not dry while being mildly seasoned. I'm not familiar with Liguirian cuisine, but I do know that it was the origin of pesto. Hence, it was no surprise that the stuffing was herbaceous and moist. 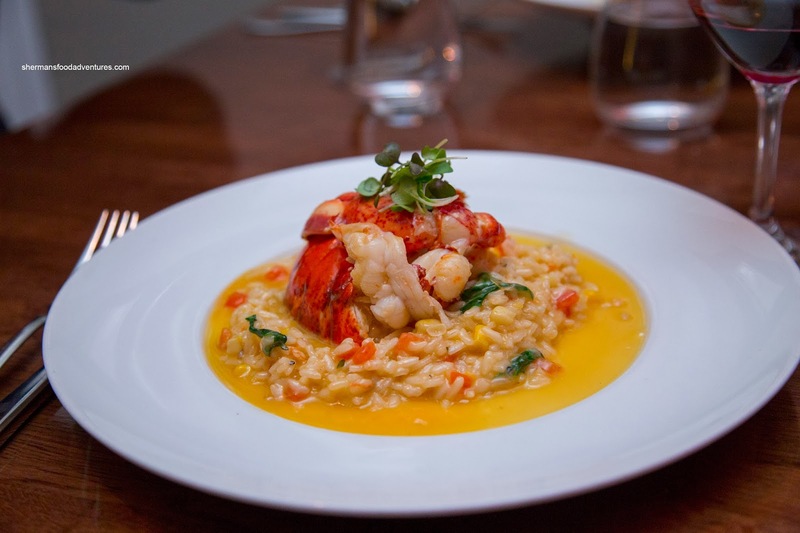 Saving the best for last, I had the fantastic 1/2 Lobster Risotto. This has been the best risotto I've had to date. It consisted of chewy, al dente arborio rice which was cooked through and spread evenly on the plate. Exhibiting a cheesy creaminess, it benefited from the sweet pop of the corn and peppers. There was a noticeable background acidity which brought balance. As for the lobster, it had a buttery snap with the unmistakeable aromatics. 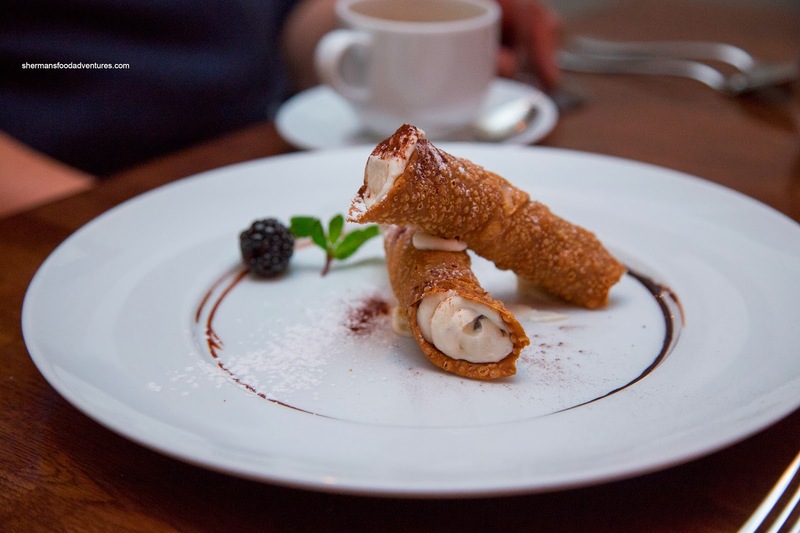 For dessert, we shared the Cannoli and Raspberry & Chocolate Terrine. I liked the thin and crispy outer shell which encased a creamy ricotta filling that was spiked with lemon zest. There were bits of dark chocolate strewn inside which added texture and bitterness. On that note, everyone else didn't like the overly tart and bitter filling. For myself, I was fine with it (call it a difference of opinion). 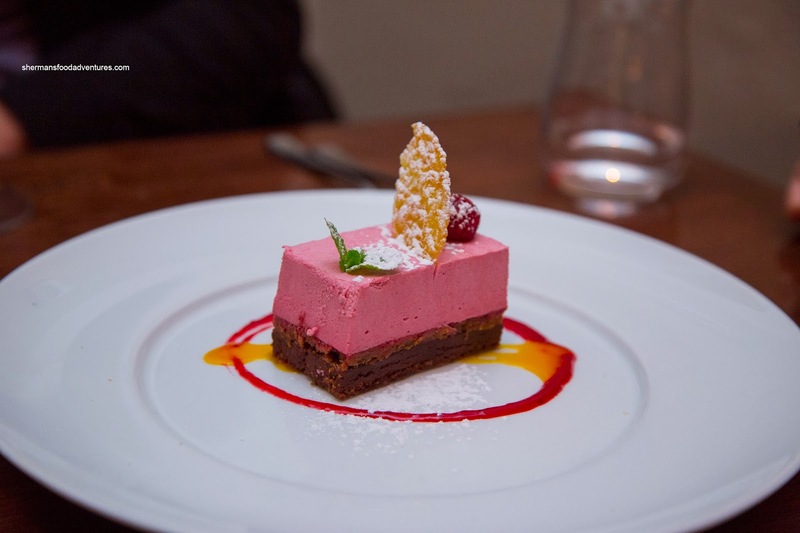 As for the terrine, the raspberry was refreshingly light and balanced in flavour while the layer of chocolate added crunch and bitterness. 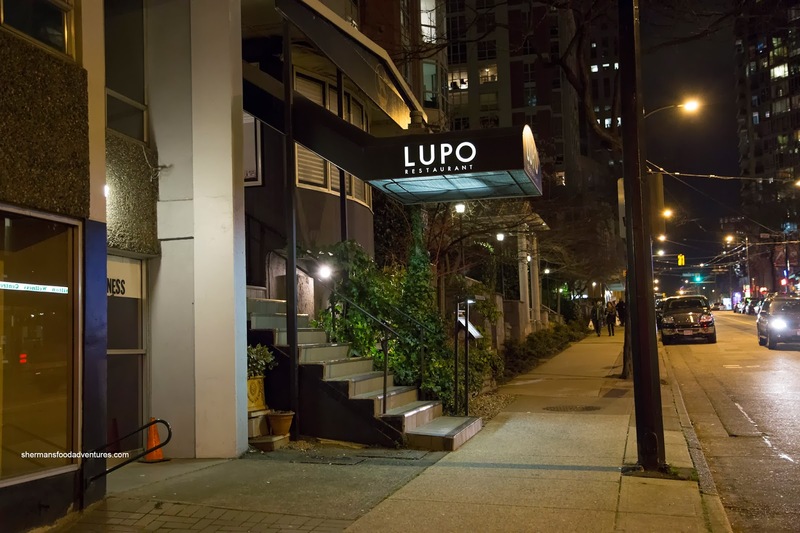 Overall, we thought our meal at Lupo was solid with a few stellar dishes, such as the Lobster Risotto. However, it definitely comes at a price. I absolutely love Lupo, and Michael has done a fantastic job there. 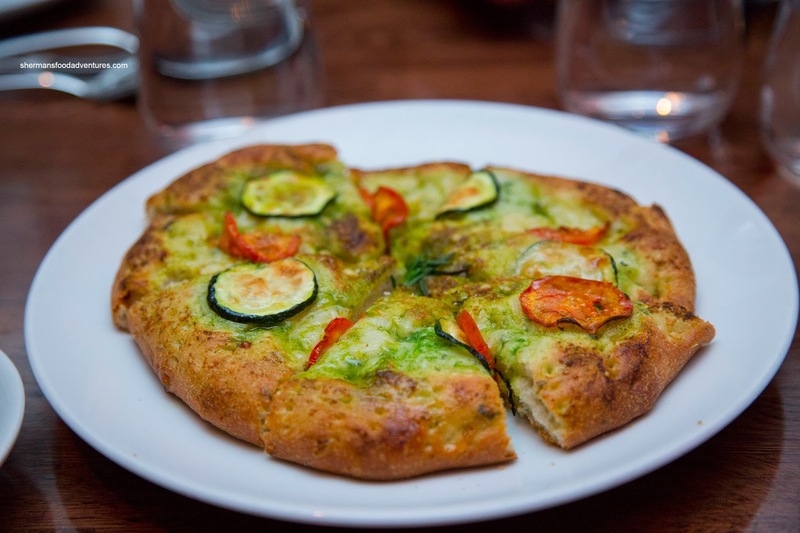 Next time you go, if you hit it up soon, make sure to try the ricotta gnocchi - I still can't stop thinking about it. It's going to have to be one of my first pit stops when I get back to Vancouver this summer. My friends who live nearby frequent it on nice occasions pretty much since it opened. Glad to hear you enjoyed it as well!